Global Stretchable Electronics Market was valued US$ 28.24 Mn in 2017 and is estimated to reach US$ 606.352 Mn by 2026 at a CAGR of about 85.31%. Global Stretchable Electronics market is segmented by application, component, and region. 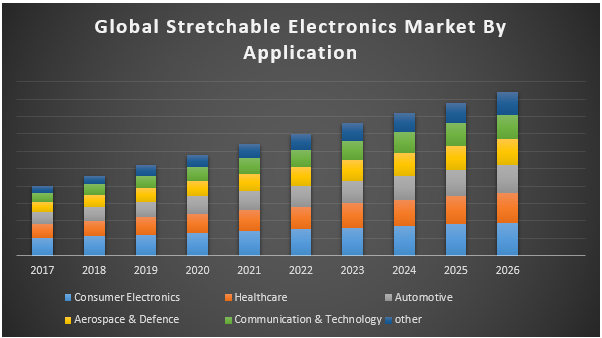 Based on application, global stretchable electronics market classified into healthcare, automotive, aerospace and defense, consumer electronics, communication & technology, and others. Rising developments, inventions and utilization of organic solar cell is booming market of global stretchable electronics market. Rise consumer electronics infrastructure and demand for electronics products of small sized are major factors boosting the market of global stretchable electronics market. Also increasing utilization for solar cells and bio-integrated devices. Increasing consumer electronics, growing need for healthcare devices and smart wearable devices are act as drivers to the global stretchable electronics market. Restrains to market growth are lack of awareness, process integration, stability and manufacturability. In terms of region, North America is estimated to hold the highest growth of market during forecast period due to rise investments in building & developing organic stretchable photovoltaic cells, IoT and touch sense eskin. North America followed by Europe, Asia Pacific, Latin America, and Middle East & Africa. Key player’s studies, analyzed, profiled, and benchmarked in global stretchable electronics market are ACREO, AIST, Artificial Muscle, Air Force Laboratory, Avery Dennision, Body Media, Cambrios Technologies, Canatu, East Japan Railway Company, Freudenberg, G24 Innovations, Georgia Institute of Technology, Host Center, Idaho National Laboratory, IMEC imperial College, DowDuPont Inc., Philips, Adidas AG, 3M, PARC, Cambrious, and MC10. 13.20.3. Rest of Middle East & Africa. 14.19.1.3. Rest of Latin America.